Only for a reservation D+3 and more. For any reservation between D and D+2 included, contact us by telephone: 0033 4 75 26 03 66. Your request will take about 3 days to be processed. Open all year except from December 15th to January 31st to carry out renovations. Your reservation will be confirmed only after you have returned the contract we send you in the mail. Please tell us all the items for prompt service. Thank you. 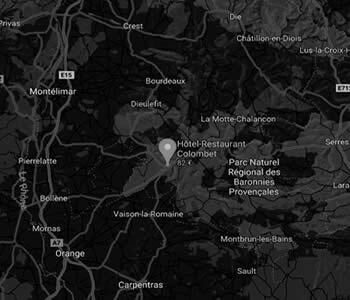 The Hotel Restaurant Colombet *** welcomes you in Nyons in Drôme Provençale, in a charming and calm place, comfortable and warm. The permanent goal of our team is to satisfy you at best. Have a nice stay at the Hotel Restaurant Colombet ! The hotel is open all year long except from the 15th of December to the 31st of January for works.